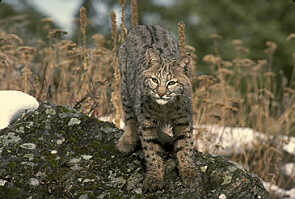 Description - The color of the bobcat is tawny (greyer in the winter) with indistinct black spotting. The tail is short and stubby with 2 or 3 black bars with a black tip above and pale or white below. The face has broken black lines which radiate onto the broad cheek ruff. Average weight is 15-35 pounds with the male being larger than the female. Distribution - The bobcat primarily occurs in scrubby country and broken forests, but adapts to swamps, farmlands and arid lands if they are rocky or brushy. They are spottily distributed from coast to coast throughout southern Canada. Biology - The litter ranges from 1-7 young who are born late April to early May. A second litter in one year is not uncommon. It is an excellent climber who often waits in the trees to pounce on their prey which includes rodents, hares, squirrels and birds; they also may take the occasional deer. Larger prey is cached and revisited. Predators of the bobcat include cougars, coyotes, wolves and humans, who use their fur for trim. Tracks - The bobcat track is easily distinquished with a round shape, four toes and no claws evident. It is generally twice the size of a domestic cat's print and loosely resembles that of a coyote or dog but is more rounded. At greater speeds the toes of the front foot spread easier than that of the hind one which has a smaller ball pad.